Interested in owning a slice of Canadian real estate? You’re in luck: the first Canadian for-sale listings are now live on Zillow. Over 10,000 new listings north of the U.S. border are available for sale on Zillow.com and the Zillow consumer-facing mobile app. Another 40,000 more will be gradually added in the coming weeks, marking the first foreign listings available on the home search portal. The addition of Canadian listings on Zillow was not easy, requiring the Seattle-based real estate tech giant to ink deals with multiple Canadian brokerages, associations, and listing services. But methodically, over the last several months, it added more and more such listing partners to get it ready for today’s launch. These new Canadian listings will look just like the American ones — each one will include the usual property description, photos, agent photo and contact information along with a link to the brokerage website. According to the company, Zillow currently receives over 100 million visits from non-American visitors each year, the majority of whom come from Canada. The listings will target both Americans looking to buy a home up north and Canadians using the site to search for local properties. Homes prices will also be presented in Canadian dollars. 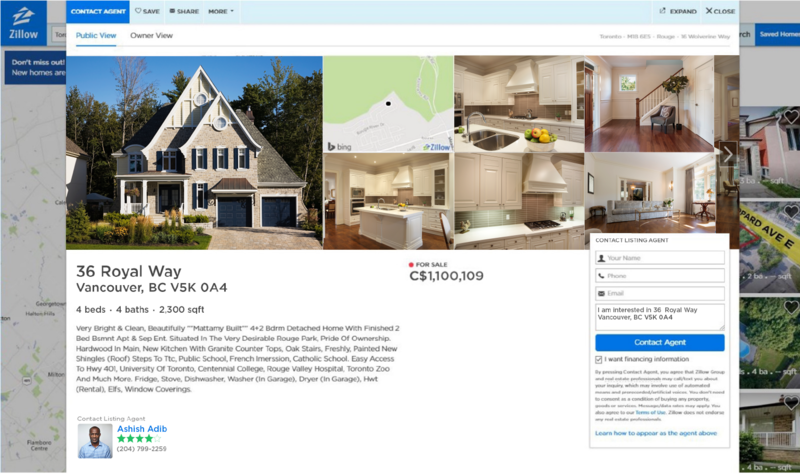 The tech company has already launched its first Canadian real estate agent profile, Seth Ferguson from Century 21 Canada. Zillow also expects to launch something similar to its Premier Agent advertising program in Canada, but does not have any details about what it would look like right now. According to Samuelson, the tech company will continue adding new brokerages and real estate companies to its Canadian base in order to offer homebuyers as many northern properties as possible. The plan is to eventually have listings in all major Canadian cities and allow users to search not only by city but also by city neighborhood, as is currently possible in the U.S.
“We’re having some great discussions, and I would expect we will continue to make announcements of additional brokerages and others that are adding their listings to the site,” Samuelson said.